Say it ain't so. 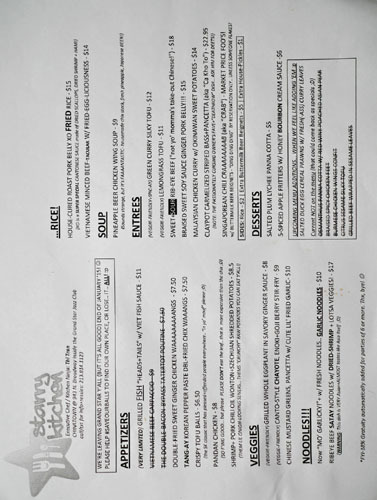 After all that Starry Kitchen's gone through over the past several years--from its 2009 start in the Trans' NoHo apartment to California Plaza to weed dinners to Tiara Cafe to here at the Grand Star--the transient eatery is planning to slang its last ball at the end of January. 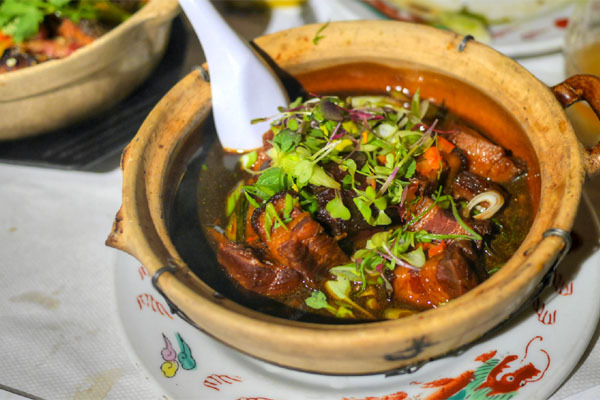 Though SK has certainly garnered its fair share of publicity and praise, Thi and Nguyen have still never had a real place to call home, so they're drawing a line in the sand: either find a way to achieve a proper restaurant, or pack it all up and go home. As such, with the end so perilously near, I had to make my way back to Chinatown while I still had the chance. Inside, the Grand Star is about what you'd expect for a small, under-the-radar music venue, but was surprisingly more comfortable than anticipated. Starry Kitchen's menu was as irreverent as ever, offering up SK classics alongside newer creations. 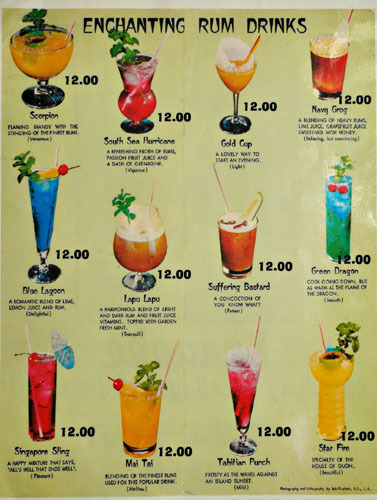 Drinks were handled by Grand Star, and comprised a menu of tiki cocktails of questionable merit, seemingly plucked straight out of 1948. We opted to BYOB at $5 per bottle. Click for larger versions. SK's food really calls for beer, so I made sure we had some good ones lined up. 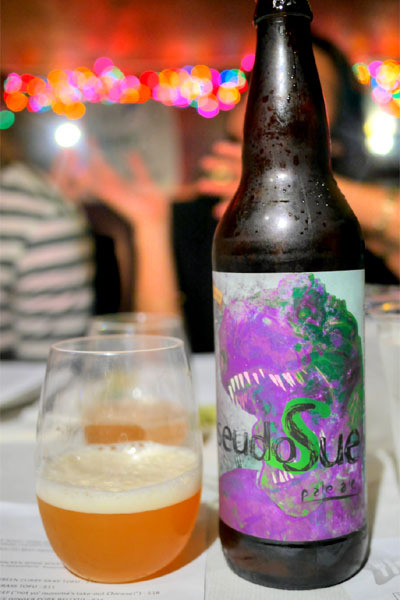 First up to bat was the 2014 Toppling Goliath PseudoSue, a single-hopped Citra pale ale. The beer was pretty amazing, smelling gloriously of aromatic citrus and tropical fruit intertwined with hops. It tasted super well-balanced, with more refreshing citrus and bitterness leading to juicy notes of mango on the back end. I can see why everyone is looking for this stuff. We began, fittingly, with Starry Kitchen's now infamous signature dish. I'd had their balls before, in my mouth, but tonight they were better than ever: delightfully crispy, yet supple, with a subtle, yet focused savoriness to 'em that went perfectly with a drizzle of spicy Sriracha aioli. 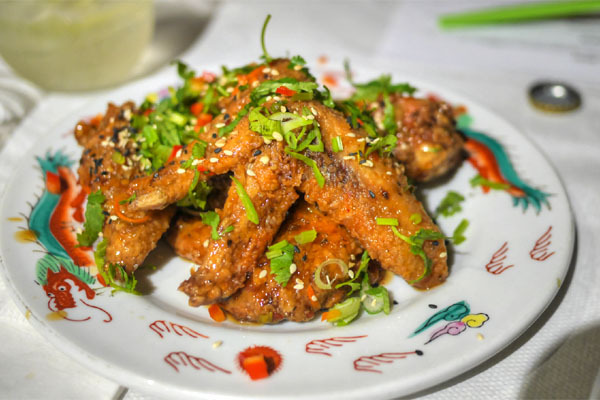 Our first of two wing preparations was the more Korean-inspired version. 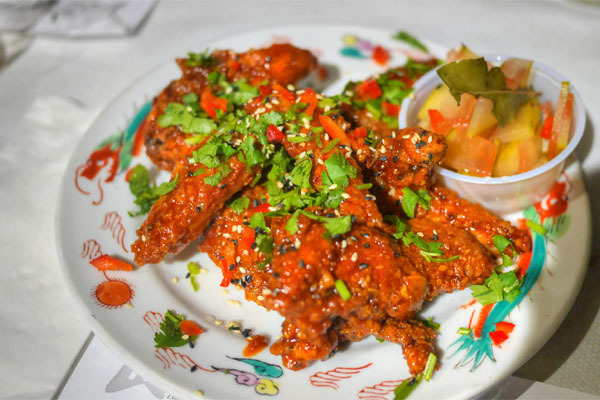 It featured a satisfying heat from what I believe was gochujang, countered by a slight sweetness, and texturally the bird was on point as well: crunchy on the outside, yet juicy and tender inside. Nice pickles to go along with, too. The second beer went in a much darker direction. 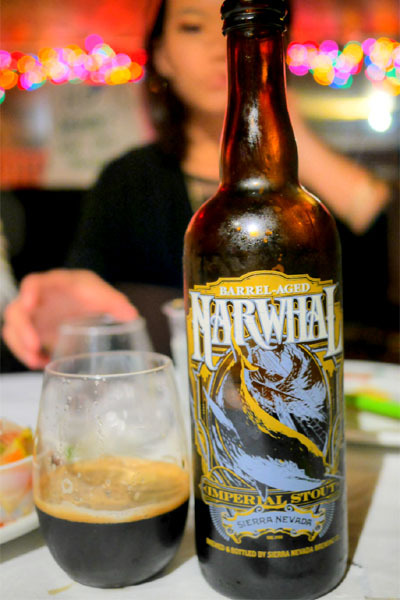 An imperial stout aged in bourbon barrels, the 2014 Sierra Nevada Barrel Aged Narwhal was super smooth and surprisingly delicate. I got a nose of wispy dark fruit, and not much barrel. In terms of taste, there was velvety chocolate and espresso, joined by a not unpleasant soy sauce-esque savoriness. As tasty as the K-wings were, these were even more to my liking, showing off a delicious blend of ginger and almost honeyed sweetness that I was quite enamored with. 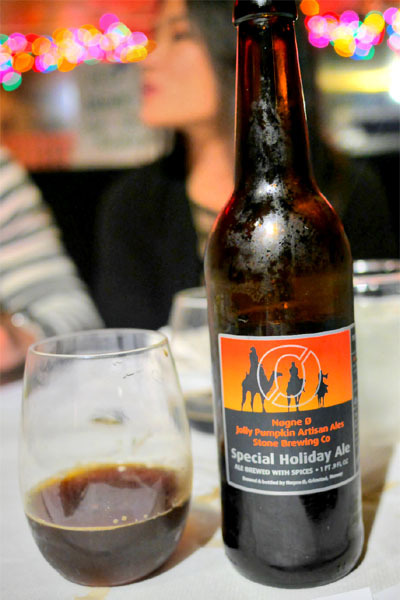 Given that it was days before Christmas, we popped a bottle of the 2014 Nøgne Ø/Jolly Pumpkin/Stone Special Holiday Ale, a collaborative brew made with white sage, caraway, juniper berries, and chestnuts. It found this surprisingly effervescent, with bountiful sweet spice in the bouquet, while taste-wise, I got lots of light, thin dark fruit and malt. 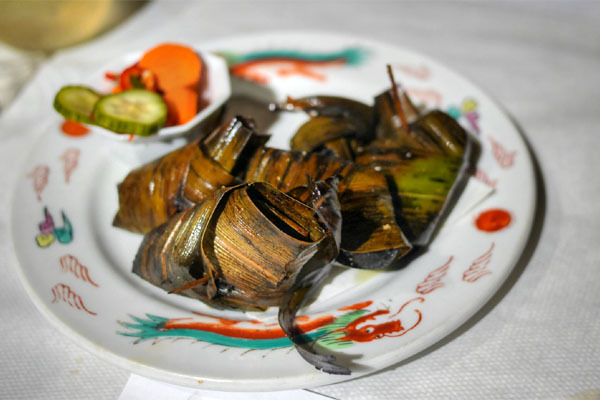 Chicken arrived wrapped in pandan, imbued with the leaves' aromatic, subtly botanical flavors. A very juicy, savory, mouth-watering presentation of the bird. 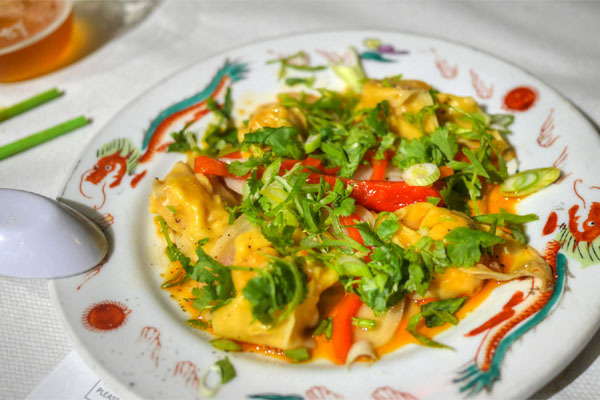 This ostensibly hong you chaoshou-inspired dish featured firm, meaty dumplings that conveyed a really nice savoriness to them, one smartly played off of the inherent spiciness in the oil while the herbs added a touch of levity to the mix. Potatoes offered up a much appreciated textural variation, but I would've liked more of those slivers. 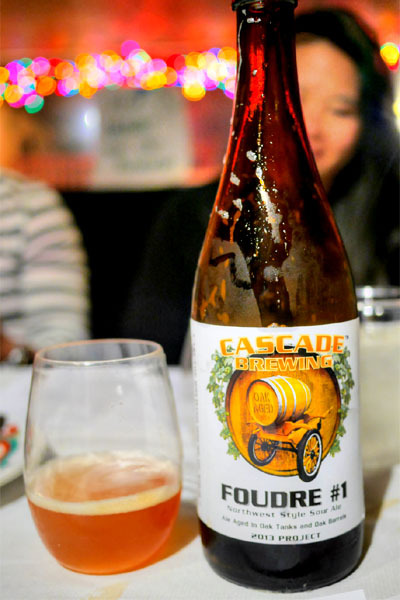 Moving on to a sour now, the 2013 Cascade Foudre #1 was actually one of my favorite beers I've tried from the brewery, a blend of tripels aged for up to 16 months in oak tanks (foudres). Think fruity and funky on the nose, while on the palate, I found it sweeter and more nuanced, with a rounder, oakier presence. 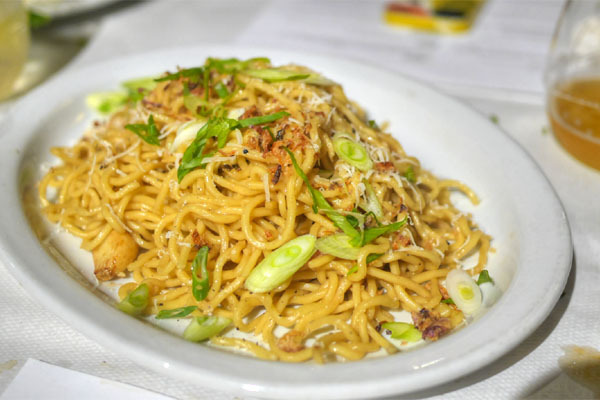 When talking about garlic noodles, everyone seems to love Crustacean's, but SK's blow the pants off theirs, especially now that the dish is made with fresh noodles. 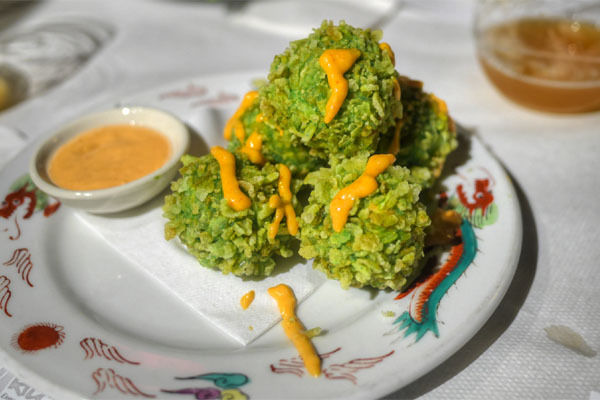 They were indeed "mo' garlicky," really garlic-forward in fact, and loaded with a deep, earthy, almost briny savor, yet tempered by the astringent scallions sprinkled on top. 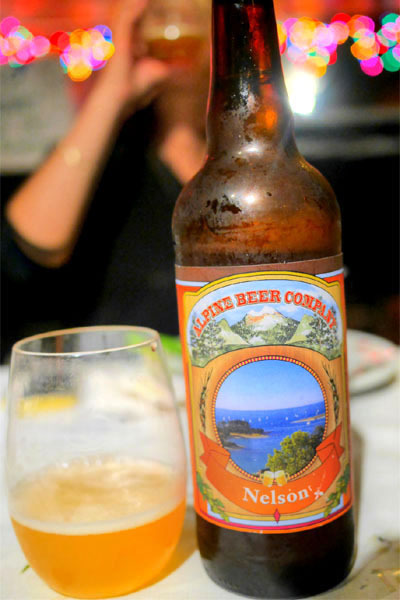 The first IPA of the night brought out the 2014 Alpine Nelson, one of the beers that the brewery secured its reputation with. Brewed with Nelson Sauvin, it really was damn good indeed, smelling really hoppy and grassy and tasting of even more hops intermingled with juicy tropical fruit. Very well balanced and a great example of what Alpine does best. 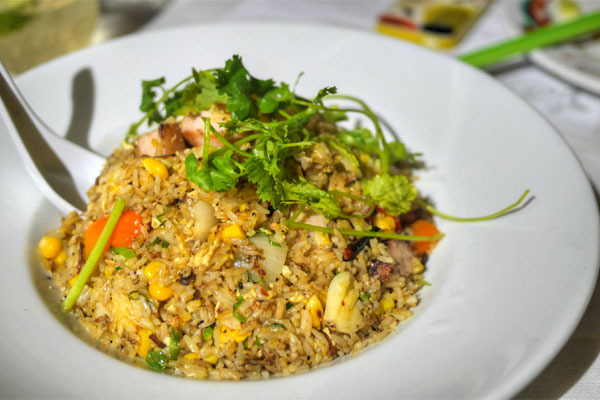 I have a hard time resisting fried rice (it being one of my childhood staples), and this was some of the best I've had. I loved the richness of the pork here, further enhanced by the heady, umami-laden depth of XO, and just wanted a heaping bowl of the stuff to go to town with. 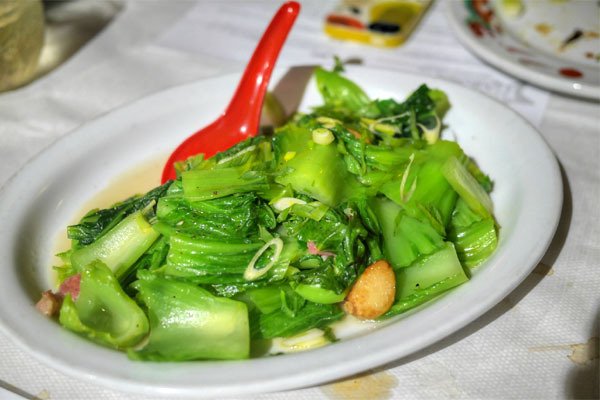 Chinese mustard was a welcomed contrast to some of the more potent items on the table. The greens were pleasantly bitter and crunchy, augmented by the salty bacon while the fried garlic added a great accent piece to the dish. 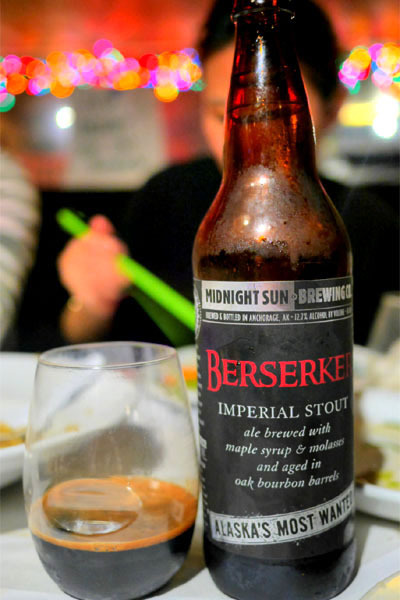 We opened the 2014 Midnight Sun Berserker, an imperial stout brewed with maple syrup and molasses and aged in bourbon barrels, to go with the more robust dishes to follow. I found it very sugary on the nose, with loads of dark fruit and molasses character, while on the tongue, it was super smooth and round, with more of a roasty quality to pair with all the sweetness. 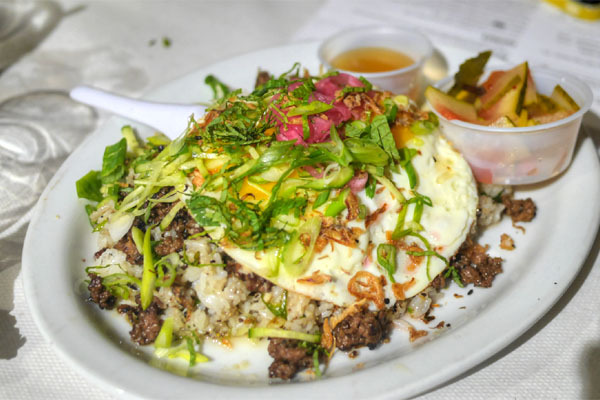 Minced beef on rice is always satisfying, and this was no exception, with the sweet, savory, well-charred meat really singing with the zesty greens and a dab of tangy fish sauce. Can't go wrong with that runny egg, either, to tie it all together. Yum. Pork belly was cooked to an almost ridiculously tender consistency here, yet there was still a gratifying, discernable interplay between lean and fat. Flavors were as deep and heady as you'd expect, a blast of sweet spice over a base of porcine goodness, moderated only slightly by the herbs up top. 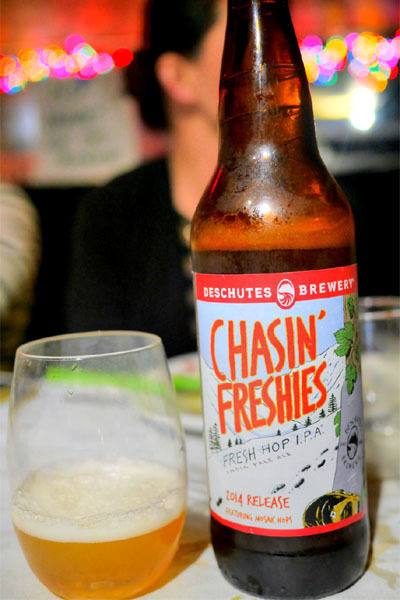 Our second IPA, the 2014 Deschutes Chasin' Freshies, was also a winner. Made only once a year and incorporating fresh Mosaic hops, this was one of the sweetest-smelling IPAs I've had, with loads upon loads of fruit on the nose. I got even more grapefruit on the palate, evened out by a superb bitterness, making for a delicious, refreshing, harmonious beer. SK's take on ca kho to didn't let me down, either. 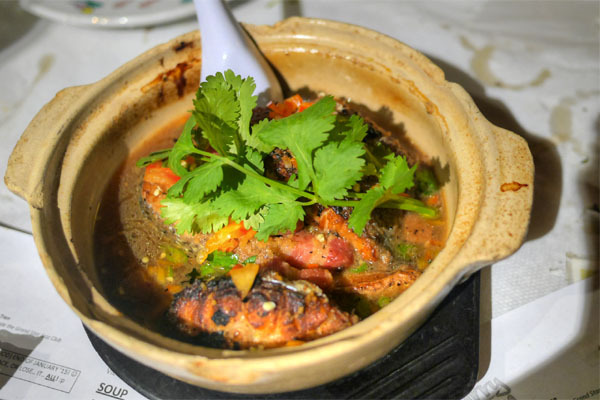 Basically a dish of braised bass (catfish is typically used) in a clay pot, the fish came out tender, yet still delightfully flaky. The flavor profile conveyed the inherent brine of the bass, but complemented it with just the right amount of sweetness and spice, making for a homey, hearty, death row-worthy sort of dish. 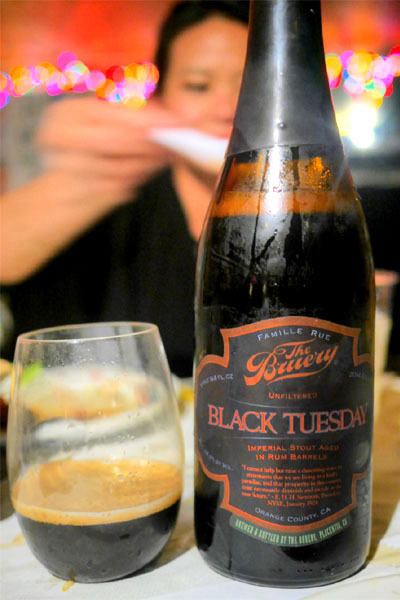 The 2014 The Bruery Rum Barrel Aged Black Tuesday was a bottle that I'd been wanting to try for a while now. I'd had the standard '14 BT recently at Black Hogg, and this was a version aged in rum casks instead of the usual bourbon barrels. I still got the notes of dark fruit, molasses, malt, and chocolate that you'd expect, but the rum gave things an additional spiciness that served as a welcomed twist to this legendary beer. 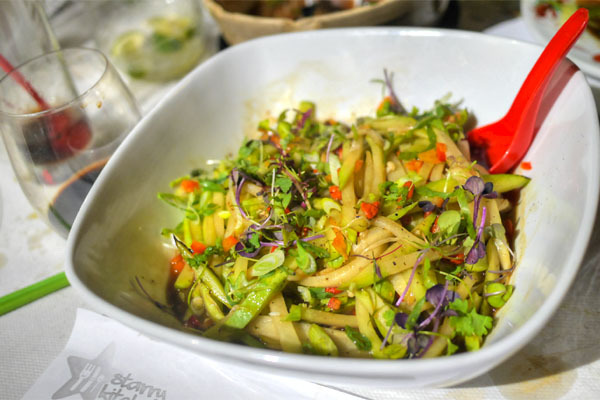 I really don't get to eat chayote all that often, so I'm really glad we ordered this dish. I loved the light, bright crunch of the gourd, and how its mild flavors were amped up by the in-yo-face savoriness of the accompanying sauce and those enokis. A super pleasant surprise, and clearly the best chayote I've ever had. 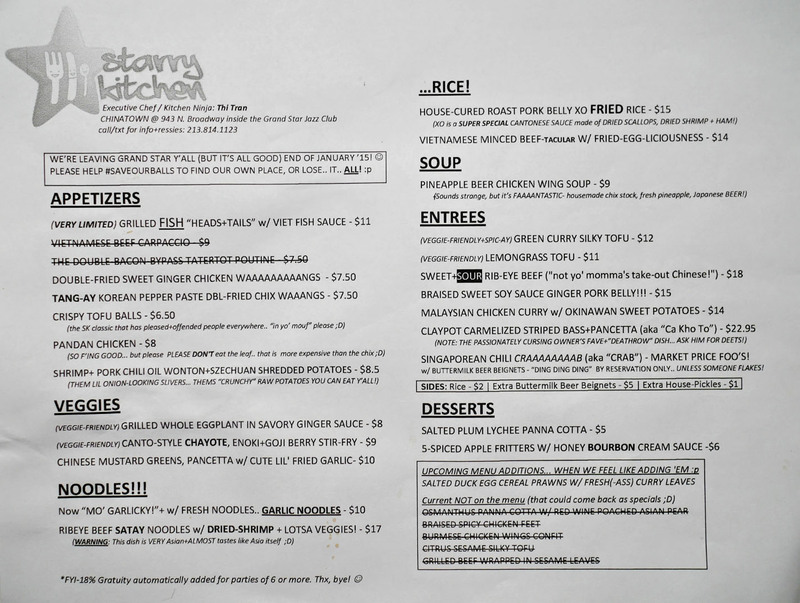 SINGAPOREAN CHILI CRAAAAAAAAB (aka "CRAB") [$66.00] | w/ BUTTERMILK BEER BEIGNETS - "DING DING DING" BY RESERVATION ONLY.. UNLESS SOMEONE FLAKES! Fittingly, we concluded with the meal's pièce de résistance, the much bandied about chili crab. It was as good as I remember, a powerhouse of sweet, supple, saline crabmeat that really showed off the essence of the crustacean. The chili, meanwhile, did a fantastic job in complementing, yet not overpowering the delicate flavors at play, making for one of the tastiest renditions of crab I've eaten to this day. 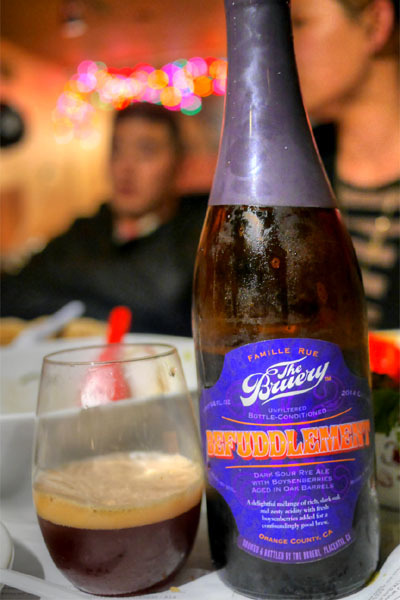 The 2014 The Bruery Befuddlement was our final beer of the night, a Hoarders Society exclusive comprising a blend of bourbon barrel-aged old ale and dark sour rye ale with boysenberries added. I'm not sure if I've had anything quite like it before. I got a base of oaky, malty flavors counteracted by a palpable sourness, the whole thing overarched by a delightful tinge of acidic berry fruit. Very cool. A couple desserts to close. 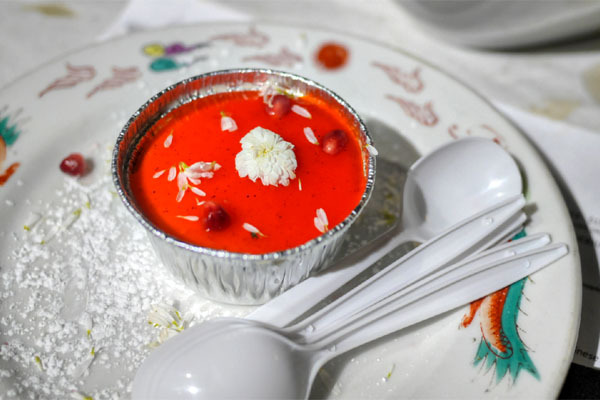 The panna cotta was nice enough, giving up a sweet, floral, tart character to go along with the gelatin cream. 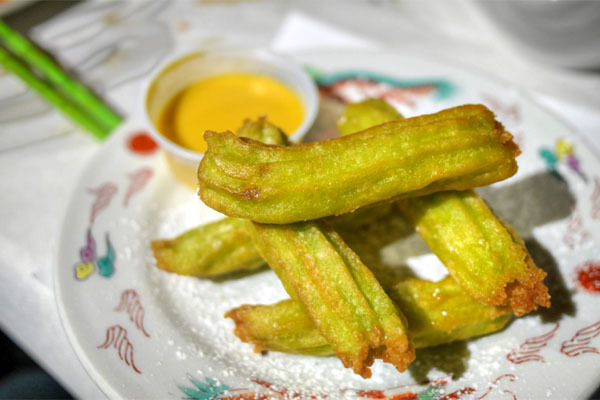 Last up was a fun, off-menu dish of pandan-laced churros courtesy of Nguyen, a creative take on the traditional treat accompanied by a great kaya coconut egg jam. I'm happy to report that Starry Kitchen's food is better than ever. The "Kitchen Ninja" has clearly been refining her craft, and it shows. That makes SK's precarious situation all the more unfortunate. From what I've gathered, the Trans already have a spot in Chinatown in mind for the next phase of their adventure, one that'll fully allow them to realized their vision. Significant investments are needed, however, to actually build out and open the space, so the pair has launched a "Save Our Balls Kickstarter" to help fund the restaurant. Time will tell if this works out for them, but I certainly hope it does (and you can be sure that I've already contributed to the campaign myself). Very similar experience to mine at Starry last summer. 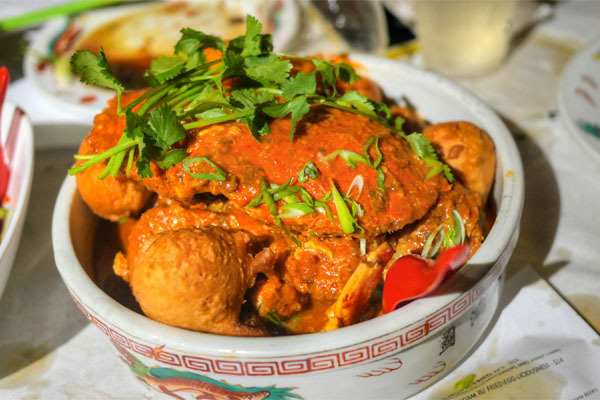 I hope they continue -- and even so we need more places to get decent chili crab in LA. The crabs I had in Singapore a couple years back were just stunning. Did you see Starry has a Kickstarter campaign for a more permanent home? ah my favorite pale ale (psuedo) and my favorite IPA (nelson). 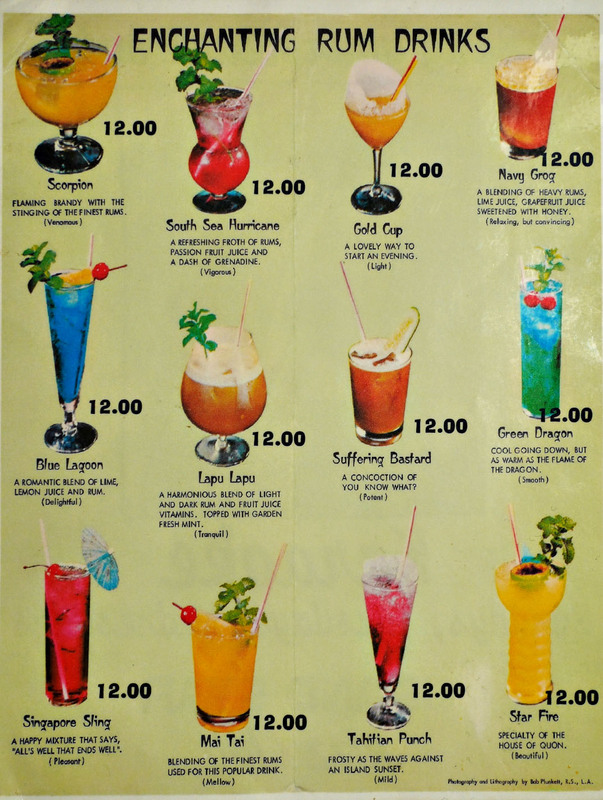 Drinking well. Need to restock up on both! Andy: I think you need to pony up for a few of those $10Ks heh. Charlie: Surprised that Nelson's your fav IPA. Would've thought it'd be something non-West Coast.